Comfy Bingo Review | Claim Your £30 FREE Bonus Cash Here! Sit back, relax and grab a cuppa with the fantastic Comfy Bingo site! It’s part of the Live Bingo Network so you won’t find any exclusive promotions here but they do give you a 300% first deposit bonus plus access to 7 days of no deposit bingo on registration. There’s a huge variety of bingo games and slots to play, either from the comfort of your own home or on the go from your mobile or tablet device. There is never a dull moment here! New players can make themselves feel right at home at Comfy Bingo with the generous welcome package. Sign up today and you will be able to claim 12 free cards to every game in the Newbie Room for a week. This will give you a chance to absorb the atmosphere without spending a penny. If you like the feel of the site there’s plenty more where that’s come from! Continue the fun with a 300% bonus on your first deposit, a 150% on your second deposit and finally a 100% on your third deposit. 550% in bonuses over your first 3 deposits. £6000 in Sliding Jackpots every evening. Buy one get one free bingo tickets. There are currently no promotional codes running on Comfy Bingo, but that doesn’t mean there aren’t some great offers to take advantage of. Get comfy as this list below is a long one, not that we’re complaining! There is no mobile app to download but the site is mobile friendly so there’s nothing stopping you from playing from the comfort of your own home or when you’re out and about on your smartphone or tablet. All you have to do is enter the website address into your browser then sign in using your login details. Don’t worry if you don’t have any yet because it will only take you a quick minute to set up an account. Plus, there is no need to worry about missing out on the welcome offer as you can also sign up and take advantage of the no deposit bingo from your mobile device. Pretty much every device is compatible with this site including iPhone, iPad, Android, Blackberry and Nokia, so everyone is catered to on this site. Bingo fans will be more than satisfied on this site with a great range of 90 ball, 80 ball, 75 ball and 30 ball bingo games to choose from. 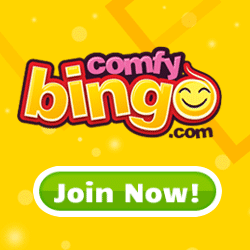 This is quite a wide variety compared to most sites which is even more reason to join www.Comfybingo.com today! There are various sizes of jackpots up for grabs and the ticket prices all vary with something to suit both penny pinchers and high rollers. They might not have the biggest selection of slots games but they’re all provided by the leading software developer Cozy Games so you know that they’ve gone for quality over quantity. With games such as Rolling in Dough, Sugar Train and Honey Bees the only question is – where to start? If you want to mix things up further there’s also casino games and scratchcards for you to try your luck on. Huge 300% bonus on your first deposit. 7 days free bingo access. Large jackpots to be won. Bingo games starting from just 1p. Similar to other Live Bingo Network sites such as Buttercup Bingo and Bingo Bytes. Payment methods include Visa, Mastercard, Maestro, Delta, Visa Electron, Switch, Solo, Neteller and Paysafecard. The minimum deposit amount for this site is £10. The minimum withdrawal amount is just £1. Withdrawals are processed within 3 working days. Customer support team available 24/7. One of the downfalls of being part of such as large network is that the site is quite repetitive. However, this is still a high-quality site with a wide variety of bingo games on offer and plenty of free bonuses to spend on them. Even if you’re already pretty acquainted with the Live Bingo Network you can’t knock back the chance to grab another bonus. After reading our review we’re sure you’ll agree that Comfy Bingo is a great option and well worth having a cheeky punt on.